Crimineeeeey. What in the Sam Hill is this? Those are the RINOs? Wowza. Kirby’s on well water, right? I hope whatever is poisoning his kooky noggin is not affecting the rest of us. Aside: 52 Followers? Good luck with your campaign #52. And best of all a parody account from back in the “Don’t put my name in the paper without permission” days has 10 times as many. Oh, man. Apparently Trump is the ne plus ultra. What must it be like to live in this delusional world where the kooky president did nothing to promote his own party’s bill, one time said this was easy and we’d have healthcare for all–obviously before he mused, “Who knew healthcare was so complicated?” Apply the magical thinking sauce, and he’s somehow the only one who isn’t at fault. Trump is the head of a nuttier cult than the Scientologists. Honestly, we still can’t understand how a man who says whatever pops into his brain (ineloquently) and contradicts himself from one day to the next has the respect of anyone. 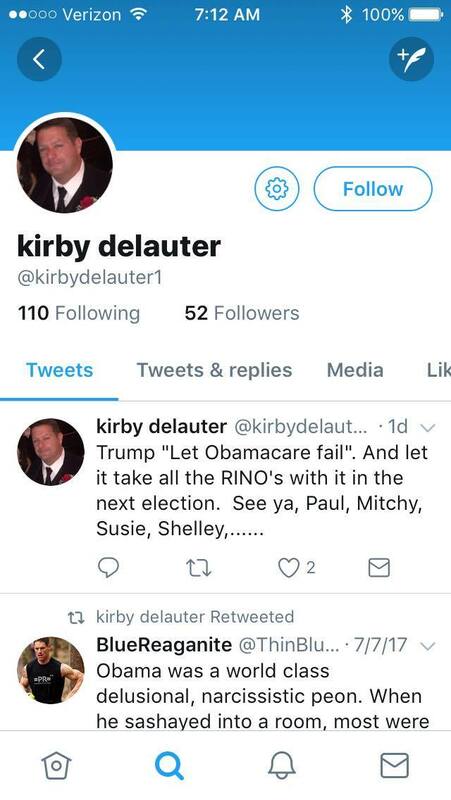 On the other hand, we haven’t been out there entertaining the idea that #kirbydelauter was a misunderstood genius, either. Obviously, Kirby the wannabe is well positioned to respect someone who is successfully using every opportunity for the government to line his pockets by putting everyone up at a family owned property at the many opportunities afforded to do so by his impressive golfing breaks from his cable news diet. Cue sad trombone for the excavator who wished in vain to get county contracts, but the council said, “No no no,” like good ol Amy Winehouse. Just yesterday a poll said about a third of the Trumpin’ cohort don’t believe DJT Junior met with the Ruskies, in spite of the fact that we know because he told us he did! How are we supposed to live in a society with these fools? Let’s not see this one elected to County Executive. We’re not too proud to beg. Next postDid Billy get into the medicinal marijuana? If you big issue with Obama was that he was a delusional narcisstic I would strongly advise you to not turn on the news.